Animal lovers, especially children, will be thrilled to learn that local author Jennifer Keats Curtis is welcoming three new additions to her kids’ book collection this fall: Squirrel Rescue; SEAHORSES; and Animal Helpers. In the creative nonfiction, SEAHORSES (MacMillan), Curtis’ evocative language and Chad Wallace’s shimmering illustrations tell the life story of the seahorse. Curtis interviewed several experts for this book including Maryland student, Nicole Moy. Moy, now a high schooler, creates and sells seahorse-shaped jewelry and bookmarks to raise funds for the nonprofit Project Seahorse. A portion of the proceeds from SEAHORSES is being donated to the organization in her honor. The nonfiction Animal Helpers (Sylvan Dell) is the first in a series of photographic journals that takes readers behind the scenes of zoos, sanctuaries, rescue centers, and wildlife rehabilitation clinics around the country. The first book, Animal Helpers: Wildlife Rehabilitators, features the work of four wildlife rehabilitators, including Kathy Woods of the Phoenix Wildlife Center in Maryland, who was the impetus of my realistic fiction, Baby Owl’s Rescue. U.S. Fish & Wildlife’s (FWS) Randy Loftus also contributed extraordinary photographs of a raptor rescue by fellow biologist Peter McGowan. “Between 2005 and 2010, I participated in a FWS osprey study and personally climbed into more than 100 nests to gather data on hazardous, manmade materials considered life-threatening to the species,” notes Loftus, “I literally removed strangling fishing line from numerous chicks and assisted in adult recovery. There is no greater reward than to save an innocent life…to right a wrong and to watch your efforts recover, grow, and then take flight.” Not only do these books educate young readers and their parents or caregivers about proper treatment of wild animals, the books are being used to raise funds for each participating center. Curtis is also working with rehabilitators, animal experts, and local Green Club members who would like to guest blog about their experiences and/or provide advice about helping animals in need. That blog will appear on the Sylvan Dell website as part of the “For Creative Minds” section of Animal Helpers. A regular in Maryland schools since 2006, Curtis is passionate about promoting literacy and conservation, particularly among young students throughout the Great State. 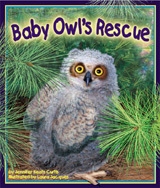 In addition to the new books, Curtis’ other titles include: Baby Owl’s Rescue; Turtles In My Sandbox; Osprey Adventure and Saving Squeak: The Otter Tale.